Corporate Casino Events: Looking for alternatives to the usual company picnic or employee recognition function? Is it time to change the team building program or “client meet and greets?” We can help! Casino Fundraisers: Need ideas for a fundraiser? We can help! First, ask about our Casino Fundraiser Brochure. Plus, we offer casino fundraiser discount pricing! Private Casino Parties: A Casino theme is a great alternative for all kinds of parties: Anniversary, Bachelor, Birthday, Graduation, Family Reunion, New Years, Weddings. We’ve done them all! We now can provide photo booth and DJ services for your events and if your not into casino gaming, we now offer BINGO. We’ll be happy to discuss these additional services with you. Please Contact us for all the details. Summertime Special: We are now offering our NEW clients a 2-table event for only $475 (plus tax) and a 3-table event for $650 (plus tax) based on availability in the Monroe County area. (A craps table is not covered with this offer, but can be added for an additional fee.) This offer is valid for events booked from June 1st thru September 1st. Please call for details! We can provide tournaments for up to 100 players. Looking for something already put together? 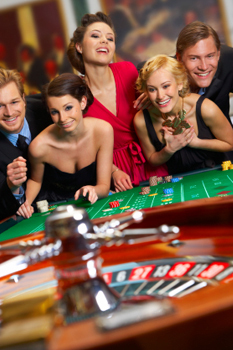 Check out our Casino Event Packages! Is there something else you would like us to offer? Contact us and we’ll be happy to discuss it with you. Ready to book Upstate Vegas Events for your casino night? If so, fill out our convenient online form to begin the casino event planning process.